08.00 a.m. : Pick up from your Hotel or Guest House in Chiang Mai, Thailand by our english speaking tour guide(s). The guide will casually talk with you about the elephants and what you will be doing as well as answer any question you have about the local culture, best restaurants, etc. 09.20 a.m. : Arrive to the Chiang Mai Elephant Camp or Elephant Farm. 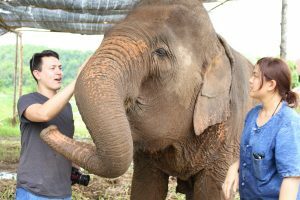 Meet our Thai Elephants, pet them, take pictures, etc. Take time to enjoy these majestic animals. Take a ride on your elephant around the Chiangmai Elephant Camp area through the jungle and the Mae Wang river. 12.30 a.m. : Have a great time having eating traditional Lanna or Northern Thai food as a mahout would. This meal is prepared by our mother Aumara Panyamoon. This maybe one of the highlights of your trip! 13.30 p.m. : Take a bamboo rafting trip down the Maewang river for aprox. 40 minutes and enjoy the cool natural water and jungle scenery. You will enjoy the cool water after your day out in the Sun during your Elephant Mahout Traing Course. 16.00 p.m.: Return to Chiangmai, Thailand safe and sound after your experience with Chiang Mai Elephant Tours. We base the time we take you back to Chiang Mai on when you are ready up until 4:00 pm so if you want to go back to Chaing Mai early that is up to you.